Does this sound like you? “Oh man, do I want this helmet or that helmet? What’s my best bet for a ranged slot item? Where does that danged polearm even come from, anyway? !” Well, fellow WoW players (at least I hope you’re playing WoW… I don’t think you have a ranged slot in real life, though I could be wrong), there’s a site out there that can maybe help you. Sure, there are addons you can get to emulate some features of today’s Wiki Tiki Utility, such as Pawn or RatingBuster, but not all of them offer the flexibility and power of Loot Rank! Loot Rank, on first glance, might look like a few boxes and checkboxes… okay, a whole lot of boxes and checkboxes… but don’t be alarmed! This is simply your way of attaining maximum flexbility in assembling a veritable shopping list of phat lewtz (as you kids say these days). The folks behind Loot Rank have even gone the extra mile of creating class templates. What’s a class template? 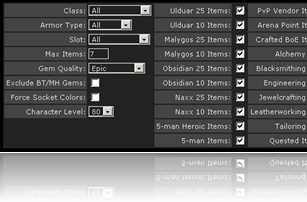 Well, rather than trying to figure out exact values for your class to make sure your loot ranking comes out perfect, the class templates provide a great starting place, filling in relevant values with appropriate weights, which you can tinker with from there instead of starting from scratch. But what’s the point of all this flexibility? Simple, it’s right there in the name: Loot Ranking! Sometimes even after comprehensive tests on a dummy, pummeling a boss in an instance or raid, or comparing numbers and bits and bobs with an addon, it’s just not obvious whether item A is better than item B. Or maybe you’re heading into Ulduar for the first time, and want to know what items you should be looking for as definite upgrades! Loot Rank will help you decide. So next time you set out to make your gear even better, don’t go without knowledge – let Loot Rank be your guide! Mondays are Wiki Tiki Utility days here at TNB! Stop from The Stoppable Force highlights a resource from the Twisted Nether Wiki’s Big List of WoW Utilities, hopefully giving you a nice boost to your Intellect – or at least your skill at World of Warcraft. If you’ve got a utility you’d like to see listed on the wiki, or one you’d like to nominate for the Wiki Tiki Utility post, please send an email to stop AT twistednether DOT netwith the subject “Wiki Tiki Utility”! I make myself crazy in raids trying to figure out whether to roll on an item or not and usually end up saying later “dang, I should have rolled”. In our guild we try to be considerate to ensure we don’t take anything we don’t need or perhaps is a better upgrade for someone else but often I’m not sure. I’ll definately take a look this addon. Thanks for sharing. Lootrank is a website, not an addon. What I did was use the weights I got from Lootrank to fuel my Pawn stats. So I basically have Lootrank in game without having to jump in and out of the game.